The “Righteous” embody a sense of individual responsibility and their participation in the life of their communities provides us with a unique moral lesson. Their example is especially important for today’s youth; here in Europe young people can analyze their sense of belonging to a common past and feel part of a collective memory that provides inspiring examples to be emulated and promoted as a value for the future. 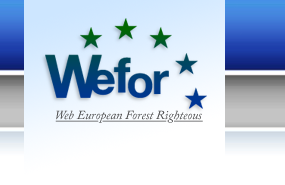 Hence YouFor – the educational section of Wefor – which aims to provide teachers with a dynamic approach to devising cognitive and educational activities. These require the direct participation of the students, already well aware of the enormous potential for learning offered by today’s exciting new technologies. Educational experiences of this kind in other parts of Europe will provide useful stimuli and interesting sources of ideas and exchanges for teachers. Our on-line project aims to disseminate information, but especially to create a network that people of all ages can use and also contribute to. The interactive tools available on the site are designed to promote debate and heighten awareness of the values expressed in the contents.